An excellent time to celebrate your child’s ability to communicate! Looking for an app for targeting a range of skills and one that the kids will love? Try another of our favourite apps – ‘Mr. 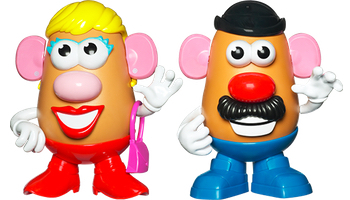 Potato Head – Create & Play’. Making requests (e.g., ‘I want…’ ‘Can I have…?’). Reinforcing grammar. Target different grammatical forms such as pronouns (e.g., HE is flying. This is HIS… It belongs to HIM…) or tenses (e.g., Describe what the potato will do, is doing or did). Giving/receiving instructions (e.g., ‘First put the legs on and then put the nose on’). Teaching location words (e.g., ‘Put the nose IN the box’, ‘He is ON the stairs’). Building oral language. Discuss things you might find in the different pictured locations (e.g., at a palace). Reflect on personal experiences that relate to the pictured scenes (e.g., a recent birthday party). Ask basic questions about the scenes (e.g., Who? What? When? Where? Why?). Build relevant vocabulary. Naming body parts or colours (You can also use visuals for the body parts/colours to reinforce learning and assist your child with making requests and choices. If your child is using sign you can use known signs and natural gestures to make requests and communicate what happened). Reinforcing emotions. Discuss how the potato head might feel if it was real (e.g., if he sees something scary and gets a fright or falls over etc). Reflect on situations you have felt these emotions. Practicing social skills (e.g., turn-taking, waiting etc). Describing pictures or scenes using your targeted speech sound, voice techniques or ‘smooth talking’. You can also use a target phrase (e.g., ‘f’ Find the…/I found the…; ‘s’ I can see…/I saw the…). Working on literacy skills. Clap the syllables for body parts, listen for ‘first sounds’, play sound ‘I spy’ or write out sentences about what is happening/what happened etc. Whatever skill you are working on make sure you have fun and celebrate your child’s ability to communicate in whatever ways they can! 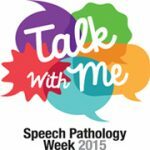 Also don’t forget about ‘Speech Pathology Week’. Enter our colouring in competition if you haven’t already (there will be some great prizes … drop into our Mornington clinic to pick up a picture if you need one!) Also if you see the Talk With Me postcard make sure you take a photograph and post it on Instagram with #Talkwithme and #SPweek. By doing this you will be helping to raise awareness of communication and swallowing difficulties in Australia.